In 2017 I did two ESPN pieces on new football helmets — one on the Schutt F7 and another on Riddell’s Precision-Fit system. 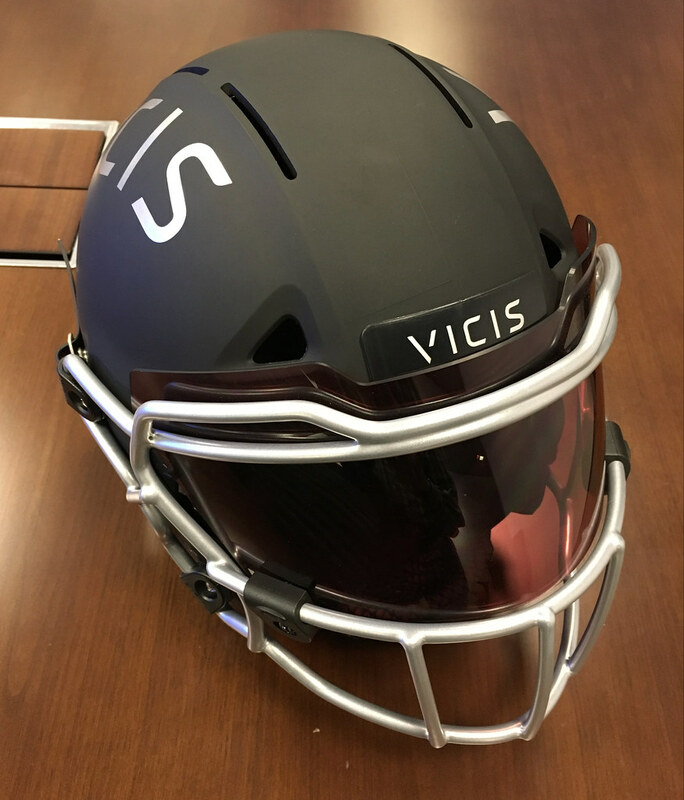 Until now, though, I haven’t written about the helmet that probably generated the most amount of buzz over the past year: the Vicis Zero1. Uni Watch: The unique thing about your helmet is the outer shell, right? Dave Marver: Right. It has to be able to deform and yet be very durable, and needs to maintain those properties even in temperature extremes that are found around the county. UW: So the deformation capacity is the same at, say, Lambeau Field in December as it would be in Tampa in September? DM: We have a “smash lab,” an internal test lab, where we have freezers and heaters so we can approximate those conditions and make sure that the helmet maintains its performance parameters. UW: What’s the material you use for that outer shell? DM: It’s a proprietary thermoplastic. And because it deforms, we had to come up with our own proprietary paint system, too. UW: Oh, I hadn’t even thought of that. So you needed to come up with a flexible paint? DM: Yes. A conventional paint would crack when the shell deformed. So we had to come up with a unique paint system, and then we had to match all of the NFL and college colors. It took months, actually. We thought we were done with the helmet, and then we had to figure out the paint. We worked with scientists from the labs at all the paint companies, and eventually we had to do it ourselves. We hired paint engineers. UW: Was there a particular color or range of colors that was tricky to match? 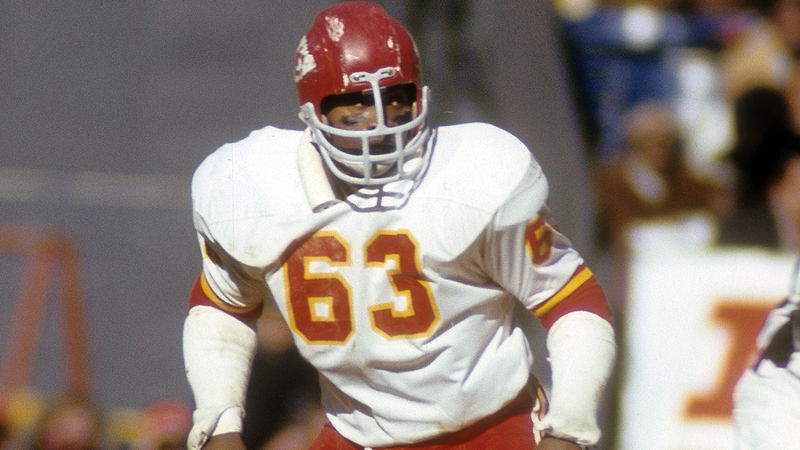 I ask that because it seems like certain teams have never been able to match their helmets to their jerseys. DM: It wasn’t so much the colors as the range of exotic finishes — the chromes, the candies, the mattes. Notre Dame was probably the most difficult, because of the gold flake. UW: Getting back to the deformable shell: One thing I’ve heard, whether talking about old leatherhead helmets or the exterior-padded shells like the one that Willie Lanier use to wear, is that when you get two soft-sided or deforming helmets coming together, they can sort lock. Like, instead of glancing off of each other, there can be some traction, which could be dangerous from the standpoint of neck injuries. UW: That’s the proper term? DM: Yes. But those were very high-friction helmets. Ours is very low-friction. We intentionally chose an outer shell material that would have low friction, to avoid that interlock issue. UW: How many NFL players are currently wearing your helmet? DM: I think we’re now up to 65 or 70 players on 18 NFL teams. We also have players on over 20 college teams, including all four of the BCS championship schools. And next year Notre Dame will be outfitting their entire squad with our helmet. UW: If a Notre Dame player wanted a different helmet brand, for whatever reason, would he have that option? DM: Of course. No one helmet is going to fit all players, so they’ll have that flexibility. UW: What’s your goal? Like, do you want to have almost every single player wearing this helmet? DM: Our goal is to help all the four million kids who play. We started with the NFL because that’s sort of the toughest problem to solve. That’s where the hits are the highest velocity. But it also gave us the benefit of being able to work with professional equipment staffs. So as we made our way through the development journey, they gave us a lot of feedback that helped us refine the concept. Now we’re working to develop additional helmet models and additional price points that will help us protect all the players from NFL down to pee-wee. UW: You’re based in Seattle, so I assume you worked with the Seahawks’ equipment staff. DM: Yes, we’re very lucky that they’re our hometown team with an innovative mindset. They met with us when we were just starting out, they made introductions to other teams, they gave us exposure to really bright, well-spoken, opinionated players. So I’d say the Seahawks were extremely helpful, if not essential. UW: Any other teams whose equipment staffs you worked with? DM: Probably half a dozen. The Chiefs, the Texans, the Giants come to mind. The Dolphins. UW: What did you hear from these equipment guys, or from players for that matter, that was reflected in your design and engineering? DM: They really helped us refine our approach to fit. We wanted to come out with a custom-fitted helmet, and they told us, “Don’t come out with a concept that involves a scan and then you ship the helmet three weeks later and I can only use it one player. Give me something I can custom-fit in 10 minutes in my equipment room. So if we pick up a player via a trade, or over waivers, I can fit him. Or if a guy changes his haircut, I can refit him.” So that really helped, and that’s how we came up with our fit system. A lot of what they told us was just practical considerations: “I don’t think you want to put the chinstrap attachment there,” or “I’ve seen facemasks like this in the past, and they didn’t work out for these reasons.” Or “This is how we clean the helmets,” or “Please make it so any visor can fit.” So pretty much practical, quotidian considerations. UW: You mentioned scanning, which of course is what Riddell does with their Precision-Fit system. If you don’t do that, then how do you customize the fit? DM: Well, the equipment manager or the player will measure his head, and then we have three different shells and a number of different thicknesses of liners. It’s a lot like professional boot-fitting. You pick the liner thickness that’s associated with your head shape and head size. UW: So it’s not as customized as a scan, but you’re saying there are more gradations than a simple Small-Medium-Large system. DM: Exactly. It’s a pragmatic custom fit. UW: Is there an inflation element? DM: No. That’s the thing, we saw that inflation was problematic, especially at lower levels of football, where the air bladders would sometimes leak as the season progressed. So we have no air bladders whatsoever. UW: Where do you see yourselves in five years? What sort of market penetration would you expect to have? DM: In five years I think we’ll have at least 50% of NFL players. UW: So you’re saying that you’ll have as much as Schutt and Riddell combined. DM: Yes, exactly. We listen a lot, and we’re going to continue to innovate and extend our technology advantage. UW: What’s the weight of this helmet compared to your competition? DM: It’s about the same weight as the Riddell SpeedFlex, and I think precisely the same weight as the Precision SpeedFlex. UW: And the Schutt models? DM: It’s heavier than Schutt, generally, and it’s heavier than the older Riddell models. UW: The SpeedFlex, of course, has its flex panel, and the Schutt F7 has its flexible armor plates. What’s your opinion of those? DM: In my opinion, those are incremental approaches. Those helmets can only flex in certain specific areas. Our entire shell will deform, no matter where it’s impacted. 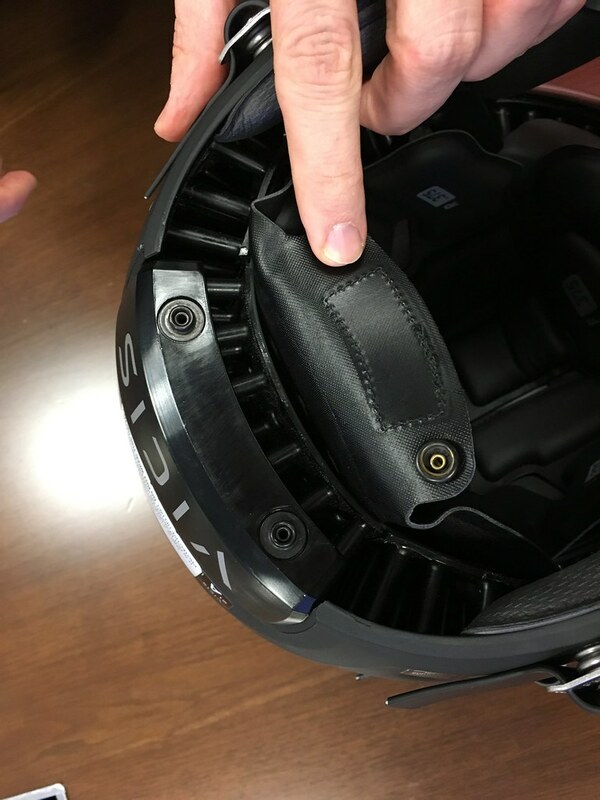 This is also the first helmet shell that offer local deformation, meaning it will deform precisely where the impact occurs — it doesn’t move the entire head along with it. UW: What about lower-impact hits, sub-concussive hits? More and more of the research is suggesting that they may be the real problem. DM: We’re looking into that. It’s difficult, because the science around that is still very young. UW: What’s your background — do you have an engineering background? DM: I have a medical technology background. For about 15 years I worked for Medtronic, which is the world’s largest implantable device company, and then I ran a defibrillator company. We’re really trying to bring more of a technology perspective to helmets. My co-founders are a pediatric neurosurgeon and the chair of mechanical engineering at the university of Washington. UW: Do you have kids? UW: Does he play football? DM: He played lacrosse, not football. UW: Was that because you didn’t want him to play football? DM: No, he just wasn’t inclined to. UW: If you had a young boy, would you let him play football? DM: Ummm, I’m not sure. I didn’t have to confront that. I think it’s every family’s individual decision. UW: What do you say to people who think kids shouldn’t be playing football? DM: They’re entitled to their opinion. I don’t really engage in the debate about football and its merits. What I see is four million kids who are playing it, and our company wants to protect them as best as we can. The same can be said for kids playing other sports. UW: I think the devil’s advocate position would be that football is not the same as other sports, in terms of its risks. DM: I think there are plenty of other sports with risks. Girls’ soccer, hockey, lacrosse. Football does have the highest risks, and certainly hitting is the intention in football. But that’s not a debate that we get into. UW: Right now you just have one helmet model, but you mentioned earlier that you’re developing new models and price points. Tell me about that. DM: We’ll have additional helmets going forward that will be optimized for younger, smaller players. UW: What’s the price on the Zero1? UW: Which is the most expensive helmet on the market. DM: [Riddell’s] Precision-Fit’s actually $1,750, I believe. UW: Oh, right, for the first one. And then I think it’s $1,200 for any additional helmets, because they’ve already scanned you. And what price point do you envision for the youth helmets? DM: We’ll see. Right now we want to finalize that design and look at the manufacturing methods and so forth. But certainly much more affordable. What I’d like to do is get it down as low as $300 or $350, something like that. UW: And what do you change or leave out to make it so much less expensive? DM: Well, we learned so much developing the Zero1, and as a result of that we have a group of engineers that’s very good at developing impact-absorbing structures. So we have new structures and manufacturing methods in mind for the youth helmets that will enable us to make the helmet lighter in weight and optimized for the impact velocities that kids experience. UW: Right — kids presumably don’t have the same velocity or the same mass, so do you don’t need as great of a deformation capacity? DM: Certainly. We have a very tunable structure. These columns that are in the helmet can be tuned for given impact velocities. So we’re looking forward to optimizing the helmet for kids, but also looking forward to position specificity, potentially. We have a very flexible architecture here. UW: Do you envision that the Zero1’s price will come down as well, based on what you’ve learned along the way? DM: I think our top-of-the-line model is always going to be in this [price] range. We want to continue to innovate and invest in R&D, so we can benefit not only NFL players but players of all ages, and we need to design the economics of the helmet to allow for that. UW: What’s your timeline for the youth helmets? DM: I’d like to see them come out within the next couple of years. I’m being intentionally vague there. Also, we’re expanding into high schools. This past year we had about 100 to 125 high school players wearing it — mostly friends of the company and kids of former NFL players, people who we knew would give us really good feedback — because we wanted to learn how to best service high schools. It went extremely well, so now we’ll be making the helmet available to high schools. And we have fundraising programs, financing programs, to help defray the costs. UW: Because this would be beyond the budgetary reach of most high schools, right? DM: Likely for most, yes. And it’s our mission to help all those kids. So for now, while we only have this one helmet, we want to have some programs to assist in the affordability of it. UW: Most helmet manufacturers offer several models, even at the adult level. It’s interesting that you came to market with just one. DM: I don’t want to give too much away, but we’ll be expanding to have a broader portfolio. Within the next couple of years we’ll move beyond this flagship helmet, the Zero1, and be able to offer a range of designs that appeal to people with different tastes, different sizes, different price points. UW: Is there a Zero2 on the way, an upgrade of the first helmet? DM: We’re going to continue to upgrade, yes. UW: When is the next round of NFL testing — the tests that you guys aced last year? DM: It’s conducted in late January, early February, and it’s typically publicized by April. UW: And is the model you’ll be submitting this time around basically the same as the one you submitted last year? DM: We will have made some refinements by the time we submit. UW: What sort of refinements? DM: I don’t want to talk too much about that. UW: But it will still be the Zero1? UW: What else do you want me to know about this helmet? DM: We have the widest field of view. It’s 13 degrees wider than some of the most recent helmets that have been introduced. As a result, the visor shields don’t extend all the way across the periphery. So if you see players wearing shields with our helmet, it kind of stops at the far sides. So Oakley has developed a new shield, called the Vicis Edge Shield. It’s going to come out in December. In addition to spanning the full range of vision, it also has no optical distortion, and it comes in different coatings, called prizm coatings, that can filter out certain parts of the light spectrum and enhance visibility. UW: Even for clear visors, which is what most players wear? DM: They do have a prizm clear, which does have some of those enhanced optics, but you do need a very slight tint to get the full effect. Oh, and here’s a cool thing: Quarterbacks and defensive signal-callers have radios in their helmets. With other companies’ helmets, you have to kind of stick the radio hardware up in between the pads. So we actually have a specially engineered pocket toward the back of the helmet, and you can slide the radio hardware in there. UW: Most helmets today have so many ridges. Some of them may be functional, but it seems like most of them are just for branding — a way to make the helmet more brand-identifiable. Your helmet doesn’t really have any of that. It doesn’t have all the peaks and valleys that so many modern helmets have. Was that a conscious choice? DM: It was. There were two considerations there. One, we knew we would launch the Zero1 primarily to the NFL, and NFL players prefer a traditional look, a more round look. That’s the aesthetic feedback they provided us. UW: Interesting. How many players did you get feedback from? DM: Maybe 50, 60. So for this first helmet, we wanted to have a bit more of a traditional look. We call it a modern classic. The second consideration goes back to your earlier question about mechanical interlock. Whenever you have those ridges, those are places where helmets can catch. They’re also stress points on the shell, and we wanted to avoid those as much as possible. UW: Could some of your future helmets have a funkier shell design? DM: Yeah, now that we’ve proven ourselves and established credibility, I think we have more of freedom to venture out in terms of the aesthetic. That’s why we stuck with snaps [for the chinstraps] — things that people are used to, even though there’s potentially room for innovation there, and throughout the helmet. UW: I confess that I’m a bit surprised by the snaps. Riddell is using that ratchet system. DM: Players actually told us that they prefer the snaps. The ratchets are difficult to use when they’re wearing gloves, and they like the ritual of snapping up. A lot of feedback that we got came down to rituals, and that’s a consideration for us going forward — staying true to the rituals and superstitions. DM: Yeah, I was surprised by this as well. It turns out that they like a traditional look for the helmets. They want them to look as small and round as possible. And that really did surprise me. When we first embarked on this journey, I thought we’d come out with a helmet that looked kind of space-age, or maybe more like a motorcycle helmet. But they didn’t want that. Even at the college level, they wanted something fairly traditional. UW: Huh. Do you think they associate safety with something familiar? Like, they’re less willing to gamble on a futuristic look if it involves their safety? DM: I don’t think safety was even a consideration. Strictly the mirror test. Because larger helmets are safer [but they didn’t want that]. I think it’s about what they’re used to seeing NFL players wearing, so there’s some legacy there. But as newer helmets are increasingly adopted, the aesthetic preferences will likely change too. UW: What other sorts of things did players tell you? DM: A lot of it was aesthetic, but a lot of it was also just comfort. We got some feedback from linemen, especially big linemen, that one of our early models extended too far down the neck. So when they were in their stance and looking up, they could feel the helmet on their neck. So brought up the rear edge a bit. That’s a good example. UW: Do you do anything with impact sensors? DM: Not yet. At this point we’re not happy with the accuracy of the sensors we see out there. Lots of false positives. And the information is not predictive, because concussions are a young science. You can get a 100G impact that’s not concussive and 30G impact that is. So until the sensors are more predictive, we feel that in some respects they’re a distraction. An interesting research tool, but the analytics have a long way to go. UW: Last question: What does “Vicis” mean? DM: It means “change” in Latin. We’re trying to bring change to the helmet category, and also the helmet changes upon impact. DM: We’re a technology company, so it’s sort of a technology nomenclature — dot-one, dot-two. DM: Zero compromises, zero defects, striving for perfection. ESPN reminder: In case you missed it yesterday, my latest ESPN column explores a simple question: We’re always hearing that college football teams need outrageous uniforms to appeal to top recruits, so how come we keep getting CFP teams with conventional uni designs? Check it out here. KRC update: The latest installment of Key Ring Chronicles is about a woman who has boxing gym membership card and a little metal skull on her key ring. Check it out here. I’m still very much in the market for new KRC entries. If your key ring includes an object of personal significance with a good story behind it, send it my way. Thanks. Baseball News: No context here, but enjoy a ballguy and umpire wearing Hawaiian shirts in a game in Australia (from Brick Barrientos). … More umpire foolishness, as footage from a 1982 Braves documentary shows an ump in Houston wearing an Astros pullover. His luggage must have gotten lost (nice spot by Jim Rodenbush). 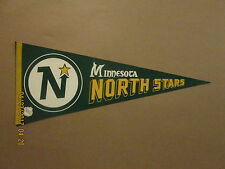 … Jimmy Lonetti came across a Twins pennant that used the Minnesota Vikings’ font. 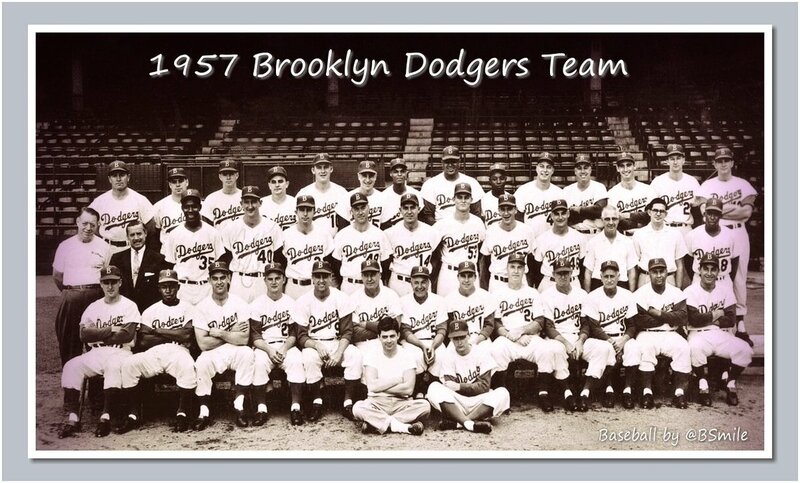 … Here’s a team photo of the 1957 Dodgers, the last year the team was in Brooklyn. 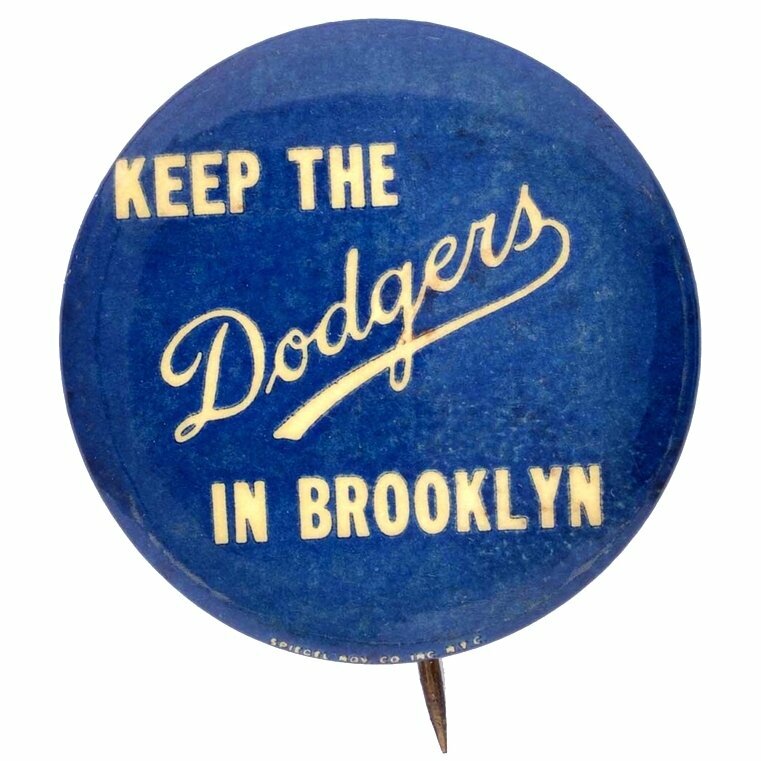 And a pin appealing to keep them there (from BSmile). NFL News: Singer Harry Connick Jr. visited the Saints yesterday and was padded up in a custom jersey (from Ignacio). … The Jaguars will serve team-colored food and beer on Sunday, including teal hamburger buns and bread (from our own Alex Hider). … Seahawks QB Russell Wilson and Microsoft are asking fans to create helmets in celebration of the Why Not You Foundation (from Gil Neumann). … On Jan. 3, 1993, the Bills mounted a 32-point comeback to beat the Oilers 41-38 in the playoffs. But the ball used for the game-winning kick is missing (from @mrmichael21). … Cross-listed from the baseball section: Jimmy Lonetti came across a Minnesota Twins pennant that used the Vikings’ font. 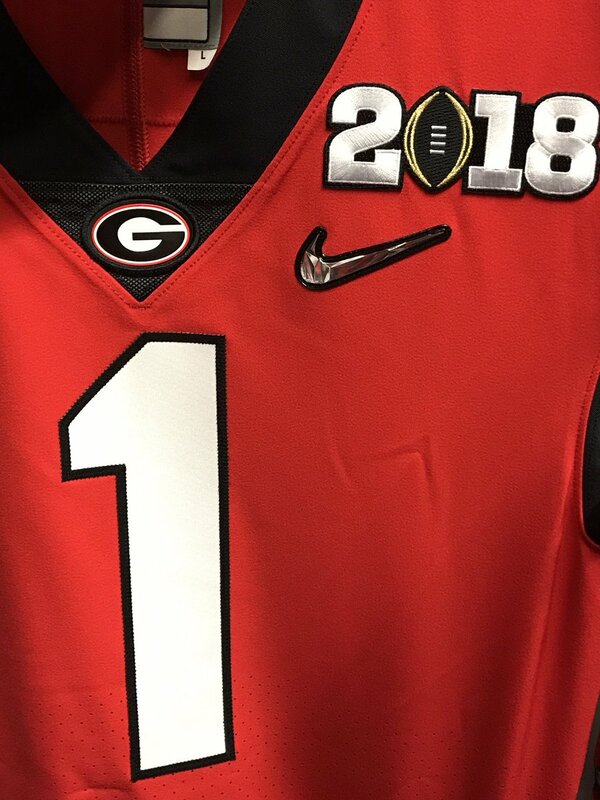 College Football News: Here’s how the CFP patch looks on Georgia’s jersey (from Chris Thorpe). … Bring on the ’Merica jokes: A player in last night’s Under Armour All-America Game was missing an “A” in on his jersey (from Patrick Morton). … The new AD at Texas explained why the Longhorns won’t be adding alternate uniforms anytime soon (from Kenny Kaplan). Hockey News: The Wild’s helmets look like different shades of green depending on the brand (from JJ). … The Senators were successful in the NHL100 Classic, so they’re planning on wearing the jerseys seven more times time this season, beginning tomorrow (from Ed Kendrick). 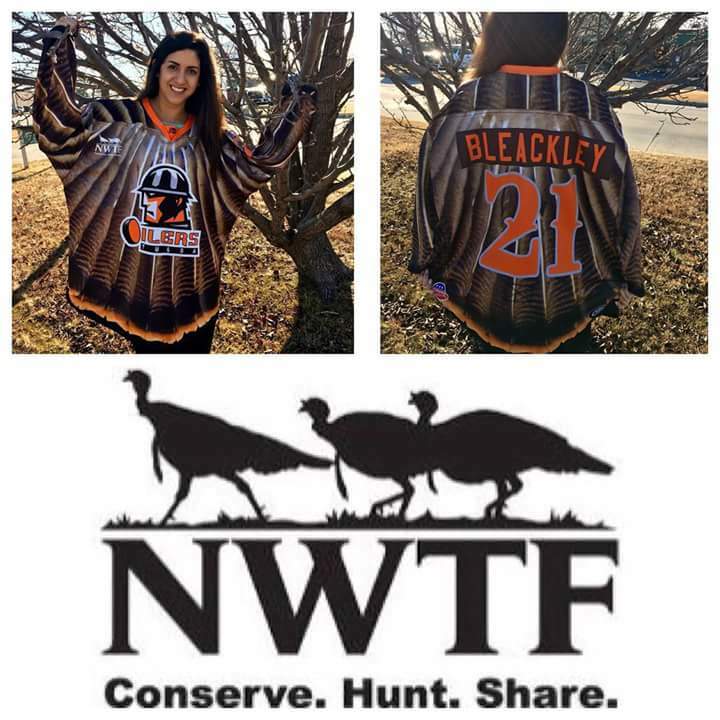 … The Tulsa Oilers, ECHL affiliate of the Blues, will wear jerseys honoring the National Wild Turkey Foundation (from Mike Iles). … The Chicago Wolves of the AHL will wear first responders jerseys on Jan. 20 and 21 (from Steve Johnston). 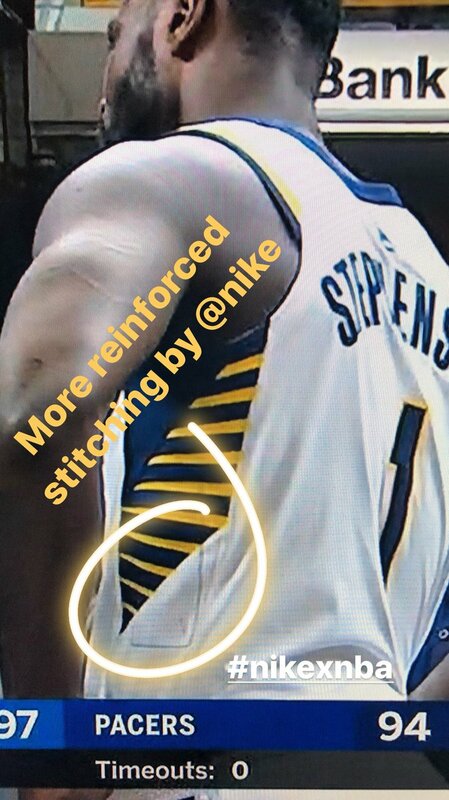 NBA News: And now a quick word from Paul: “Last week I retweeted this photo, which appeared to show some reinforced stitching — presumably in response to all the torn NBA jerseys — on Lance Stephenson’s uni. A league official contacted me yesterday to let me know that the stitching was actually for a mic pocket, not for durability.” … Here’s a rundown of the Suns’ uniform history. … The Erie BayHawks, G-League affiliate of the Hawks, will wear camo unis for “Salute the Troops” night on Jan 28. 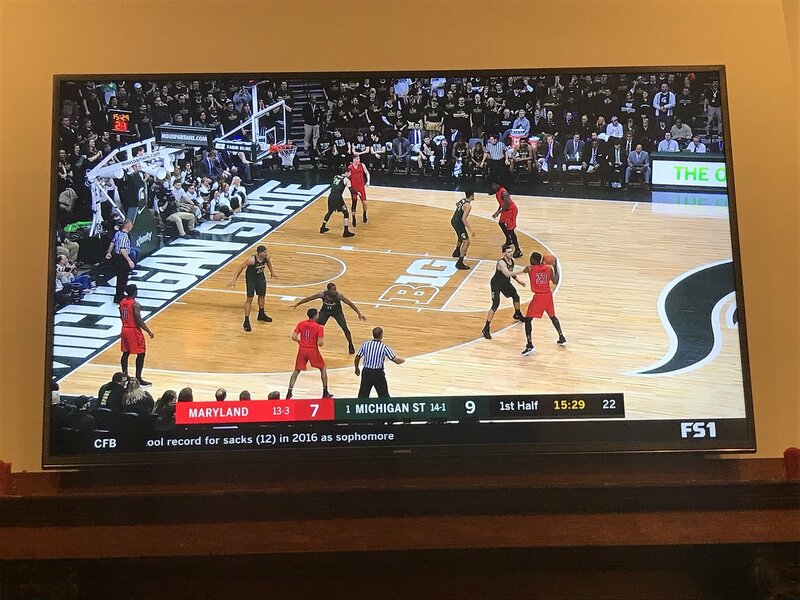 College Hoops News: It looked like Maryland and Michigan State were still celebrating Christmas last night (from Steven Gong). … Iowa wore black last night (from our own Jamie Rathjen). 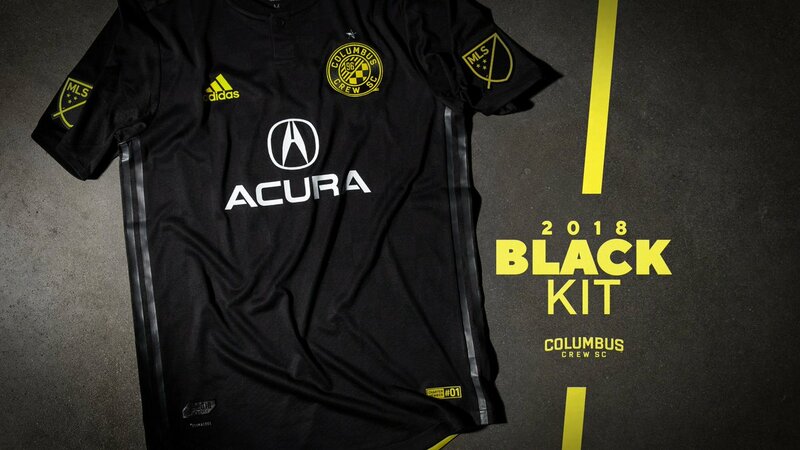 Soccer News: New black kit for Columbus Crew SC. They put out a black printable schedule as well. Genius! (from @CoryMizer, Sean Spitzer). … The rest of these are from Josh Hinton: Bizarre pre-match jerseys for Man City and Chelsea. … New away kits for Man City and the New York Red Bulls. Grab Bag: New home greys for Ohio State men’s volleyball (from Ed Zelaski). … Fans are upset after Italian cyclist shrunk the size of the Italian flag on his jersey (from Mike Edgerley). … Some seriously intrusive advertising at the PGA Tournament of Champions in Hawaii (from Justin Hicks). The black kit for the Crew makes sense since this is likely a year of mourning up there – the owner and league are trying to steal the team away to Austin, TX for 2019. Such a bummer. Unrelated note – has anyone heard anything about a 25th Anniversary patch for the Marlins? It would be a great opportunity for Jeter & Co. to rebuild some goodwill with the much-dumped on fanbase if they brought some of the Teal/Black design elements and had some throwback days to the World Series winning look(s) they had before they moved into Starship Loria and changed the team name. To ignore the anniversary would only further disassociate the team from the 1993-2011 era which is what Loria was so keen to do. The number indicating the Crew as MLS charter club 01 feels like salt is being tossed into the wounds of Columbus supporters. No patch for the Marlins this year. Any rumors on the Marlins switching back to something similar to their original design with the new ownership? They had a great batting practice M with marlin logo, I always thought they should have just gone with that. Crew: The tag at the bottom of the jersey saying “Charter Member #01” for being the first MLS franchise is a slap in the face to its fans when there is 99 percent chance the team is leaving at the end of the season to Austin which not only screws over Columbus, but San Antonio from getting a team as well. One benefit of the European promotion/relegation system is that team rarely relocate and if they do like in the case of Wimbledon, fans can start a new team from scratch and work their way up the leagues. The Bills ball hasn’t gone missing, it’s been for 25 years. Re: the Grab Bag cycling item, the reason that’s controversial is that national champions’ jerseys, especially really established countries like Italy, have a traditional design which can incorporate some elements of the wearer’s team jersey – but not, generally, the other way around, because the national part is supposed to be distinctive. So it’s not necessarily any individual’s prerogative to make substantial changes to the jersey for their tastes. Wow, that Italian national champion kit is underwhelming. This gallery shows a lot of good and some atrocious national champ kits. Paolo Bettini’s Italian kit is the traditional and looks fantastic. Ditto the Norwegian champs and Vinokurov’s Khazak T-Mobile kit. Then there’s the abomination of Tyler Hamilton’s Rock Racing version of the US champs kit. Ugh. It only adds to the tragedy of his shameful career. It makes Freddie Rodriguez’s Jelly Belly US champ kit look downright conservative. Interesting item about the Vicis. Thing I notice about them in an aesthetic sense, especially with Alex Smith, is the size (and blankness in his case) of the front bumper, especially since the Chiefs haven’t put a wordmark there. Somewhat distracting. But again, thanks for the article. I totally agree. Great interview by UW, but the entire time I kept waiting for PL to ask him about the unusually-huge front bumper plate, and why it’s sized as such. For instance, expecially with Alex Smith’s, which has no Chiefs wordmark or logo, it looks like a great big empty billboard that’s in-between posters. I’ll follow up with Dave and ask him. Makes me wonder about the actual necessity of front bumpers for all helmets. Paul- thanks for checking into this. Still, it sure is BIG and especially noticeable when there’s no 3D bumper attached to it. 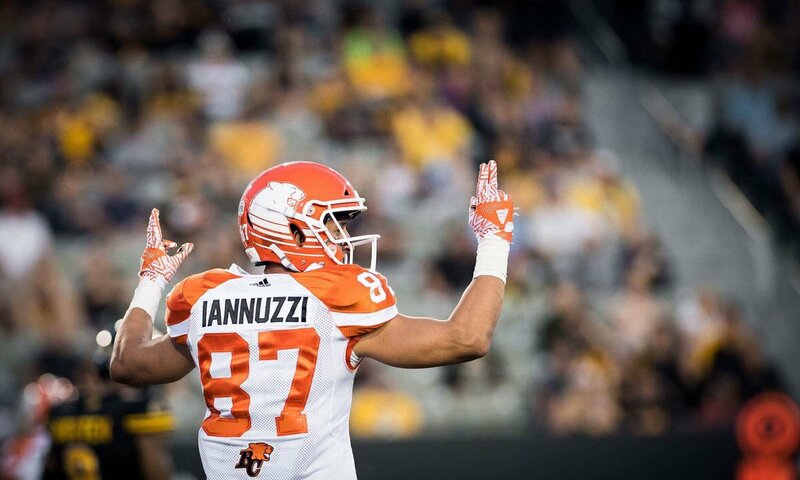 I’m sure it was mentioned yesterday when the ESPN article went up, but flashy uniforms probably only matter on the fringes where you’re looking for something else to sell. Some kid deciding between two mediocre schools might pick the school with cooler unis all else being equal. The kids Alabama are recruiting are so willing to go to a great program that they don’t even care that they’re going to be living/playing in Alabama, much less the unis. We can discuss uniforms without insulting an entire state. Thanks. The qualities of a state are very much central to the question of recruiting. I think location in general is important, sure. And every location has its pros and cons. And we can discuss that in an intelligent manner without issuing blanket insults to a given location. Let’s please move on. Thanks. While it is true that places like Miami, USC, or various warm weather southern school have an inherent advantage, that doesn’t really explain how cold weather schools like Ohio State and Michigan can recruit so well, and especially Penn State, which is cold and basically in the middle of nowhere (which I assume was your point re: Alabama). Really comes down to the success of the school. Hey Paul, we’re all 4 cfp teams Nike schools again? I think they’ve had a clean sweep since playoffs began. Really interesting interview Paul, thanks for posting. I hadn’t considered how helmets require optimizing for so many factors at once — safety, fashion, performance, versatility/ease of fit… and how those things then bring up other unique issues like the flexible paint. Also surprised that players prefer the round traditional helmets, which to me looks way less cool and more dated. Thanks, Scott — glad you liked. Josh Rosen(UCLA QB pictured above) suffered a concussion, while being slammed to the ground as he hit the back of his head. Also, Seahawks Cliff Avril suffered a potential career ending neck injury. Both wore the Vicis helmet at the time. There will never be a concussion-proof football helmet, and everyone needs to understand that. Football is a collision sport, and people are inevitably going to get injured. The good news is how technology will be part of the solution in reducing head injuries. Tackle football is still a great sport, with plenty of retired players doing well. Youth participation has dipped, but some of those parents are waiting until their children are older before starting to play. the Riddell facemask, they don’t have any impact monitoring, it’s very heavy, and the jury’s still out on the softer shell. I thoroughly enjoyed the Vicis interview. After reading it, I am really pulling for them to succeed. Thanks, Steve — glad you liked. Matching green whether it be helmets, jersey material or breezers is always a problem. When the North Stars were here they had similarly mismatched helmets; the CCMs were always closer to matching the team’s green shade while the Jofa helmets were always a much lighter shade of green (the two most popular brands at the time). Great interview Paul. Another instance of matching colors on helmets being such a science. I never would have guessed how difficult it would be to match colors from a jersey to a helmet. Thanks, Greg — glad you liked! Paul, what a fantastic interview with Mr. Marver. Great questions that uncovered a treasure of backstory facts on the Vicis. Thoroughly enjoyed every line of the piece! I believe a few CFLers wore the Vicis this year as well. Marco Iannuzzi for the Lions comes to mind. 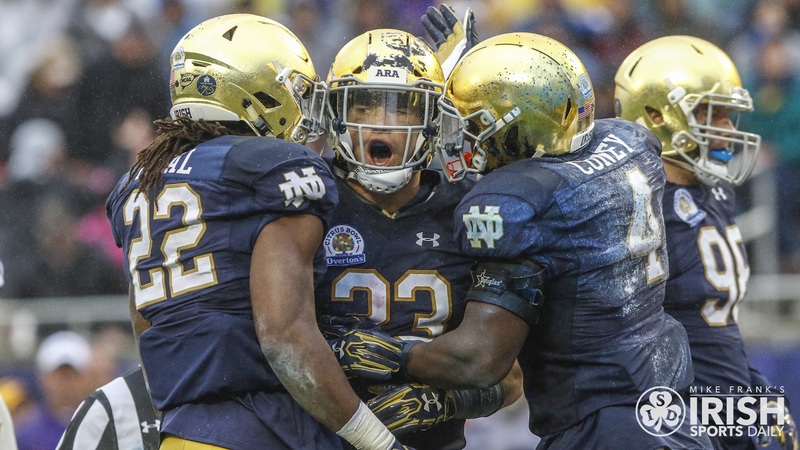 Anyone else notice that there were some black streaking on some of Notre Dame’s Vicis helmets in the Citrus Bowl? Seeing the Vicis example above is this because the underlying shell of the Vicis model being black as opposed to grey like Riddell models? That’s a really interesting question regarding paint for different helmets. Also does the need to make a paint flexible enough to deform with the rest of the helmet result in the paint coming off in streaks rather that big chips that might happen with a harder shell? The Citrus Bowl was played on artificial turf. You can even see the crumbled up truck tires in this photo. He still calls it the BCS. I’m surprised it was so difficult to get a paint that could flex with the helmet. Similar paints has been used on car bumper covers for several years. And I thought a 9% drop in folks watching the NFL in 2017 would be what sinks football. I think a $1500-2000 helmet may be what does it. Awesome interview about the Vicis helmet and great column on college football playoff teams and their uniforms! Do you know if the Alabama equipment staff has less work to do than Oregon? I assume they must, yes. I didn’t know that even though alternate uniforms were dumped in the nhl this year, teams can still wear their outdoor game jerseys. Is this applicable to the Sabres and Rangers also? (If so, I suppose Maple Leafs and Caps too). If teams can do this, can they still do the thing where they wear an alternate for the entire Stanley Cup Playoffs? Loved the article! Did a presentation about the helmet and company. Lots of stuff out there about it! The Wild’s different shades of green might just be the light reflecting off the helmets. 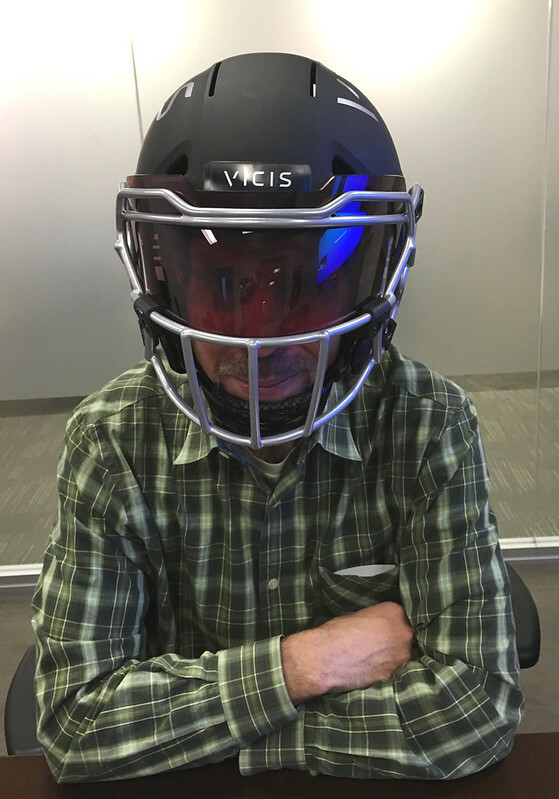 Paul, as always, the transcript with the helmet manufacturer is a very interesting read. Thank you very much for your work over the years-I read your site nearly every day and continue to be fascinated. Please keep up the great work. Thanks so much for the kind words, Mike. Glad you liked today’s entry! Great interview, Paul. And I’m guessing it’s the first time “quotidian” has been used on Uni-Watch. Nice. Interesting article on helmets, but as was stated above, there will never be a concussion-proof helmet. As lovers of sport, we need to ask ourselves if the size & speed of today’s players makes the game “too dangerous” in its present form. Is it OK for people to destroy their brains permanently for our 3 hours of weekly amusement, when the game would STILL be exciting if we eliminated helmets altogether and instituted things like weight limits for players, in order to lesson the force of impact? The fact is that today’s game isn’t the game our parents grew up on, and to blindly continue along with minor tweaks like helmet tech misses the point, and does a disservice to today’s healthy young kids who will be suffering from CTE 20-30 years from now. Great interview. I became interested in the technological and aesthetic approach of Vicis very early and am happy to see more information and publicity coming out about the company and its products. I am also happy to hear someone corroborate my suspicions about friction and catch points having a potentially negative impact on the shell’s performance. Function over form! 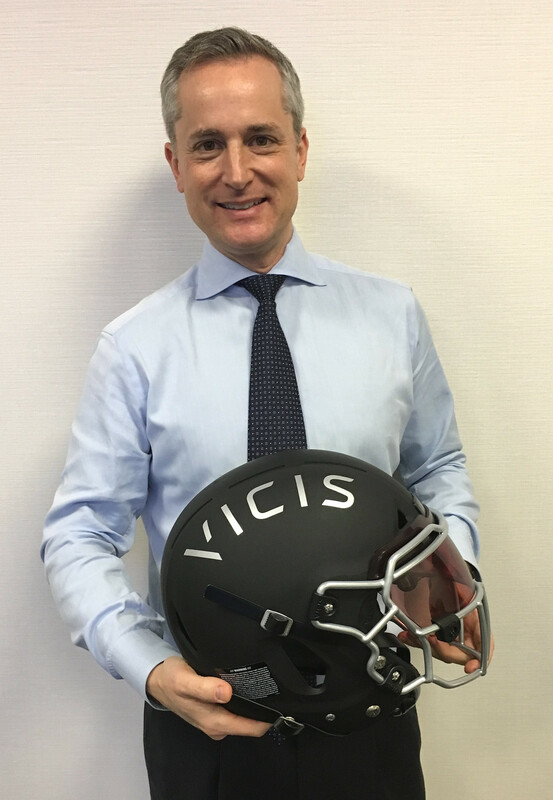 Wonderful read about the Vicis helmet. Thank you. I guess they like their “Ms” with horns. The lakers (in gold) are playing the hornets (in white) at Staples. Curious to know if this will be considered a “white” vs “white” matchup and if it’s the first one of the season?